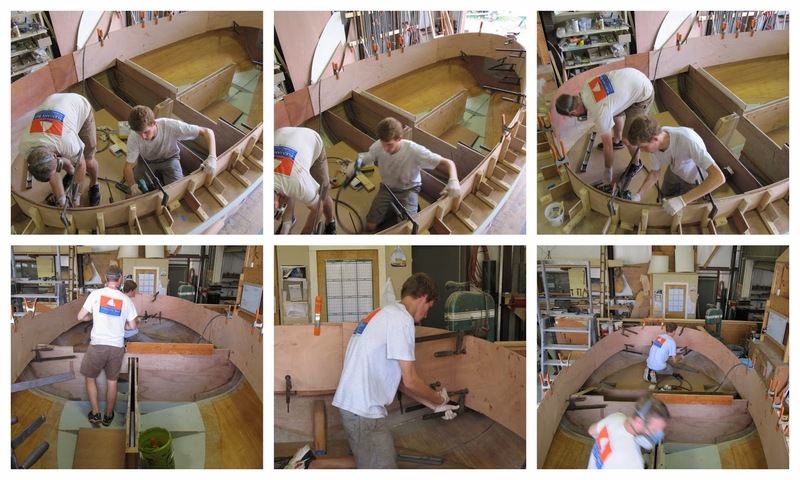 The Hurricane sloop we've been building for Bill Ryan is finally nearing completion. It's been a long process since we decided to include a new deck mold in the project. Norah is stunning; a real sleek and fast-looking profile until you get a look at the cockpit. There's so much room! Without skipping a beat on details, we have worked hard to keep the construction simple but stylish; function but beautiful. 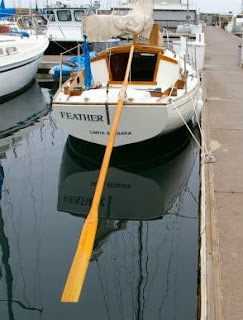 The trim on this boat is all teak with varnished coaming and bare seats and floors. The rails have been left unfinished as well. The juxtaposition of eight coats of varnish alongside the unfinished seats is stunning. It will keep maintenance and varnish anxiety to a minimum; an important consideration as far as sailing priorities are concerned. The floorboard details are unique and a stand-alone feature that we hope will distinguish our Hurricane from other day sailors. The storage on board is amazing for an open boat. Forward under the deck is a roomy anchor locker. This boat will not have a hatch, opting for easy access to stowed gear. Under the seats are bays that can hold life vests, cushions, and other gear. Cushions would be a lovely option! The bridge deck serves as storage on Norah. Our first Hurricane, Meander used the bridge deck to store batteries to a Torqueedo outboard. This owner has chosen a sweep! We have designed a simple spruce oar that will stow under the deck out of the way. When needed, it can slip into a rowlock located on the transom. Not everyone would be comfortable rowing out of a tight spot but this boat is a perfect size and weight to skull. It will look like the sweep pictured here on the right. Granted there's no reverse but warping a couple of dock lines could get you out of this situation. Norah will be on a mooring and not docked, and will have a good chance of maneuvering out of tight spots. One of the challenges we face as production and custom boat builders is knowing when to draw the line. If the owner is creative and willing, this boat calls out for customization. The cockpit is a prime example. We can configure it to accommodate any design. We are toying with the idea of installing a Mastervolt Pod E Propulsion System in a Hurricane. It may require altering the bridge deck but it's certainly feasible. How wonderful that could be to not have an outboard hanging off such a beautiful transom! Rigging, hardware and a test sail are next on the order. The spars are made, varnished and ready for the final hardware fitting. The remaining deck hardware just arrived, and those parts will dress up the somewhat barren look very quickly. We are setting up the main sheet system same as Meander. There'll be two cam cleats on port and starboard, allowing sail trim from either side of the boat. It also keeps the cockpit clear of lines and hardware to trip over. Jib sheets will have winches and halyards will run aft for easy access. This boat couldn't be easier to single-hand but has all the modern techno materials to make it thoroughly functional and fun! The shop is closed for the holidays and the crew is getting a well-deserved break. The next month will be a huge push to finish two custom orders. The Hurricane Norah is ready for all the hardware. But it's this 20 foot catboat that has consumed the shop for the last month. We'll mark the one-year point in a few days, and the Cranmer's have started their punch list. The Mastervolt 3.5 Ultra will arrive at the very end of January. All the trim has been installed. The bridge deck interior is nearly complete. There's still a floor for the lithium batteries to install, but not before the plumbing. There's a tendency to start to rush after all this time, but we have to go slow, make lists and be sure we've remembered what gets buried below the floor before it is too late! The hatch is beautiful and functional; best of both. The louvered washboards are ready for installation after the break. The cockpit sole has finally been permanently installed, tabbed and marked out for the engine hatch. The seat uprights are tacked in. They still need some trimming. Not having the actual engine to measure from made everything very difficult and we almost boxed ourselves into a serious miscalculation. But that's why I prefer to work as a team. Someone is bound to call out the error. We caught it, fixed it and moved on but not without losing a few days in the process. January will see even greater progress. Now we're getting somewhere! Steve Smith from AkzoNobel worked with Brian and Seth to prep and spray the non-skid on the house roof and deck. We had decided to add a step in the process by taping off where trim was going so there wouldn't be that awful issue with varnish bleeding under the taped non-skid. We had started doing it with the Classic Cat deck but wished we had created it in the mold. Regardless, it makes is so much easier to apply varnish or other finishes without the headache of detailing afterwards. We're using Awlgrip throughout on this project, for several reasons: durability and compatibility.We know that Awlgrip boasts a 10 year life span, which sounds good on a hull this size, stored outdoors in Maine. There will rarely be an optimum time to paint. The second and most important reason is compatibility: we'd seen the failure of one part paint on a cold-molded hull before, and seen plenty of print-through. It seemed silly to build the boat so conscientiously only to slap on a one part paint as the final finish. Penny wise, pound foolish as my mother would have said. The deck and house were sprayed first with two coats, then the cabin and coaming were primed. The final coats of Awlgrip white will be sprayed once all the woodwork is complete. She is beginning to look gorgeous! The sequence of wetting out is shown below. One half per day and there's little room for mistakes. The cloth must lay nicely or the crinkles + wrinkles will forever be set in epoxy. when it's done properly, the results are wonderful. The guys did a perfect job of it. The house gets a layer of 1/2" plywood which in turns gets puttied, sanded and re-puttied as needed. 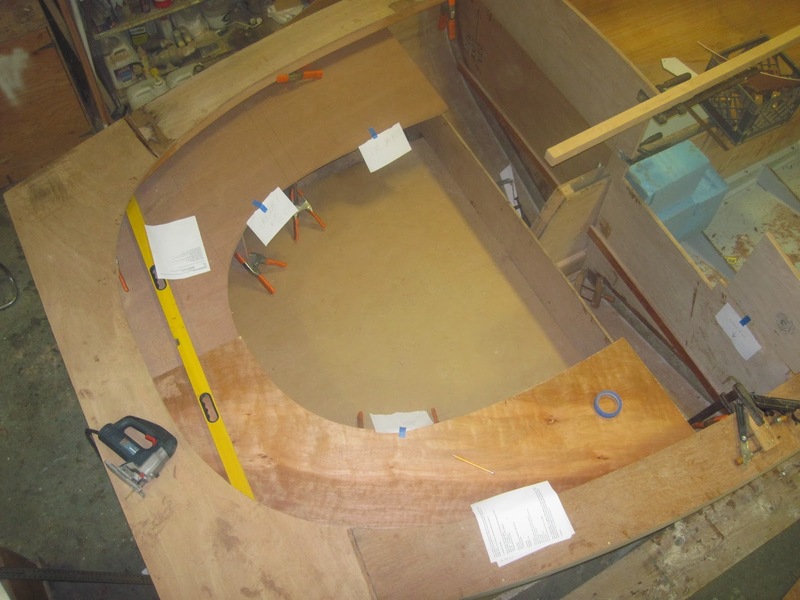 The companionway opening is cut. Seth has cut some hatch slide dummies to get a sense of things. In the meantime, working off the boat, he's built the centerboard (1" PVC) and installed it. The lifting mechanism needed to be designed around the hanging locker next to the centerboard trunk. All in a day's work. Dynel is a very fine weave material that runs and snags if there's anything to catch it, making a mess of the cloth pattern we're hoping to maintain. The fabric mimics traditional canvas. Because it's wetted out in epoxy, it really adds an additional layer of protection against abrasion. at the risk of repeating myself, it's all in the preparation. Seth mocked up the cockpit (hence the notes for the owners who were still away). But you get the general idea: this will be an incredible cockpit with plenty of room for company. The Mastervolt Ultra 3.5 will be located below the sole eliminating the need for an engine box. The water tanks (bladders) will be located just aft of the bridge deck, which houses the Honda generator and Lithium Ion batteries. 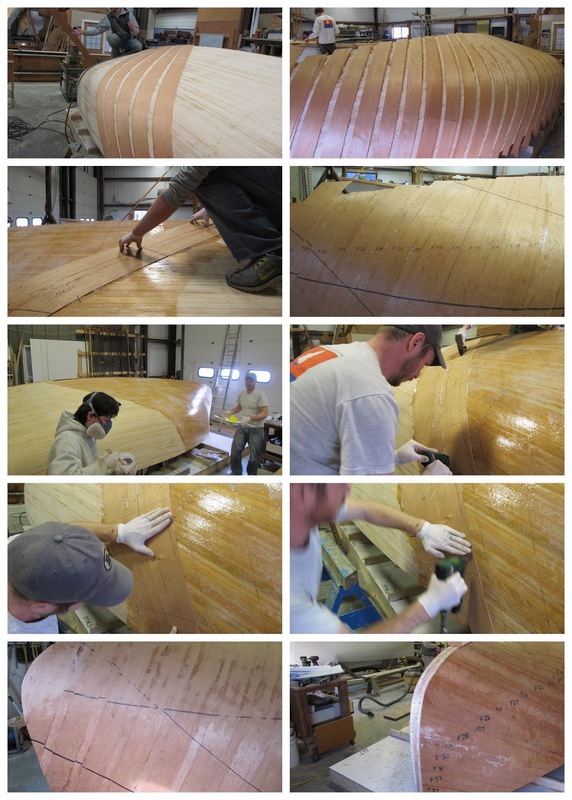 The photo sequence (above) shows Seth and Brian gluing up the coaming. We made it out of three layers of 6 mm Okume ply, giving us a 3/4" coaming. The carlins and deck beams add plenty of strength to the overall stiffness of the glue-up. Now the cabin house beams get fitted. But first the ledge or carlin, which you can see by looking at the roundness of the house will not be a quick job. These photos show the work completed in July through the first week of August. All the floors have been tabbed in place. Biaxial was used to sheath up to the waterline. There'll be berths and half bulkheads surrounding the bilge so the vote was to minimize more fiberglass work. It will look neater and give the owners the option of clear-coating the strip planking above the berths. The plywood deck is down and Seth is starting to lay out for the coaming. It's August so there's sailing to be done, customers to take care of on the water, and we're still building the Hurricane! The bilge needs to be primed and painted. And the owners threw in a curve ball by requesting water tanks below the sole. The walls were already in place but not yet tabbed so Seth was able to move them in order to accommodate two bladders. The owners were in Maine all summer so any decisions had to be made via email. Visualizing was made easier with photos but nothing takes the place of being there. By the beginning of September the pace was starting to pick up and we were all getting back into the swing of things. There's a lot to think about now that the hull is turned right-side up. The deck beams have been laminated off the boat on a jig so they're ready to cut into place. The first step, however, is to grind, sand and fair the inside hull; it's another time-consuming process that requires more tenacity than skill. Floors are located and set into place. The cabin bulkhead was tabbed into the hull during the building process so that part is located, eliminating further guesswork or planning. The anchor locker bulkhead does need to be located, cut and set in place. It's a tiny space but holds the mast step, partner and requires an opening. The deck camber has to be included and from that point we can start to see the actual cabin interior dimensions. We are miles from designing the interior at this point. And we are about to close this project down; spring commissioning has started in full force! We have three Classic Cats, one Hurricane and a number of Classic Cat upgrades to build, plus launch everyone else so there's no way we can concentrate on the Cranmer's catboat. It's a good time to stop. 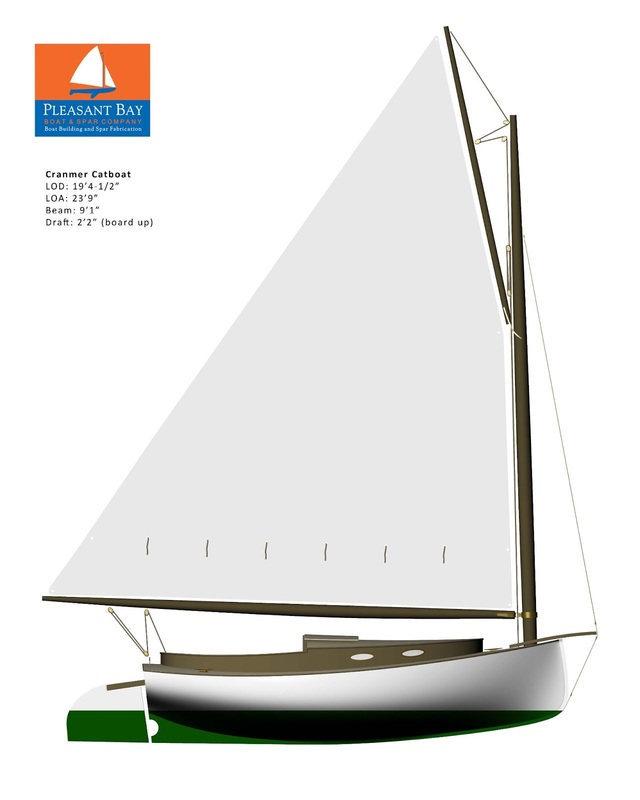 April: Building a Cold-Molded Custom Designed 20 Foot Catboat: the Big Day Has Come! We were finally ready to flip the hull in mid-April. The hull was primed with a combination of Awlgrip 545 and Hi-Build primer. Interlux 2000E was used below the waterline. The hull looks beautiful, fair and pleasing to the eye. Seth and Brian get everything ready for the turn over. 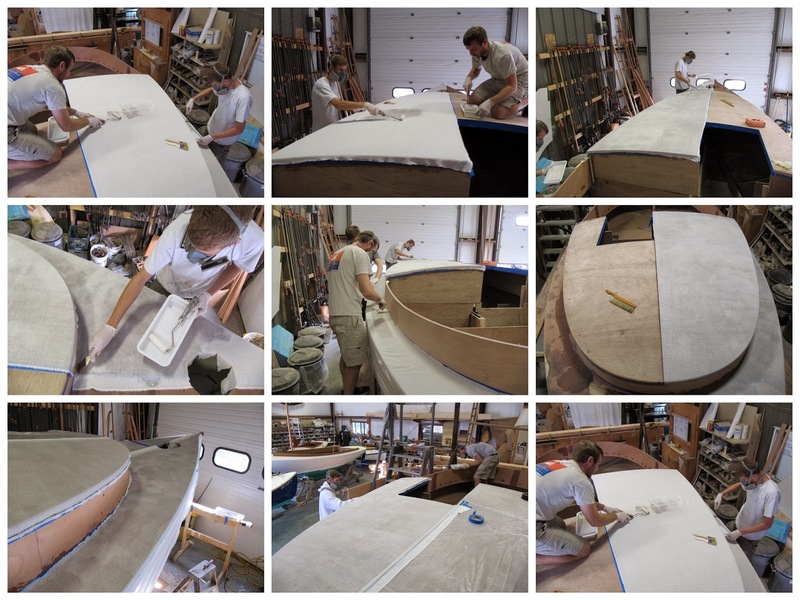 The owners, Mike and Susan Cranmer, help build a turning cradle that allows the hull to slide and turn simultaneously, resulting in a pretty seamless procedure. The video shows it all happening within the span of an hour or less. The anxiety was apparent with some of the crew but in spite of the owners' presence, we were all pretty happy once it was turned upright. 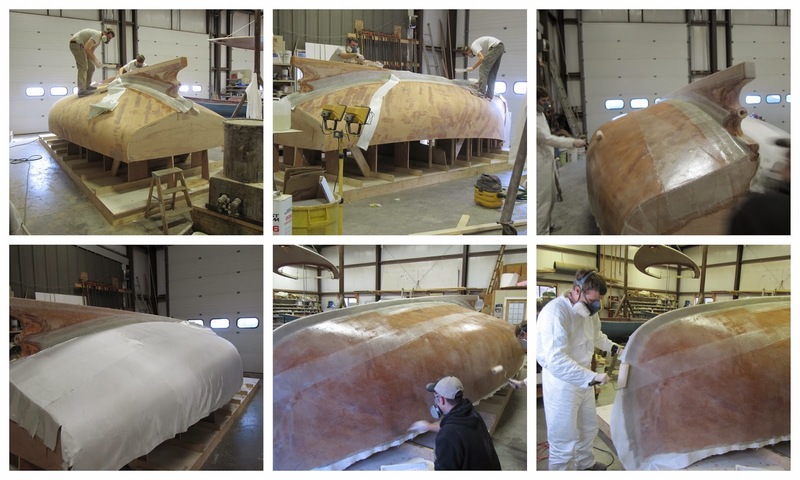 The sheathing took no time at all, thanks to the very near perfect fairing and prep that the crew did beforehand. The function of sheathing the hull is primarily to give a good surface for paint and to protect the cedar veneers from chafe. But it would have resulted in a poor surface had it not been properly faired. The Landing School has been a fantastic resource for Pleasant Bay Boat and Spar Company. A couple of crew members have gone to the school which accounts for why we began the discussion about the notched trowel method of fairing a hull in the first place. In my opinion, this is a process that should be reserved for novice builders. It could be argued otherwise but I thought we had been careful about building a fair hull from the get-go. The drawings were digitized, and then the molds cut from those drawings on a CNC machine. We were spot-on setting up the molds and backbone. But in the final analysis, given that we did have some hollows, the process prevented further sanding mistakes. The end result was incredibly fair, and we will see what the outcome will be next season when the epoxy has had a chance to bake, shrink and move about. I did concede that we saved time but not materials. The process required an additional 10 gallons of West System Epoxy plus the 407 fairing filler. We are installing an inboard, most probably an electric Mastervolt, so there’s all that to factor in the equation. The skeg needs to be shaped to accommodate the prop and shaft. More putty is applied. Later in the month, the crew is ready to tab the skeg, fair (again) and sheath the entire hull. 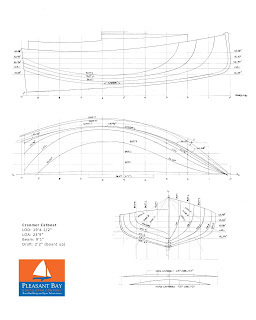 There’s a lot of talk about following the Landing School approach to fairing post-sheathing so I am on the phone researching the process and debating if that’s the route we should take. Sheathing goes pretty quickly in spite of the on-going debate about the final fairing process. We used 10 oz cloth over 1708 Biaxial set in West System epoxy. These photos were taken on March 14, 2013. The progress in one week is phenomenal. Ten days after starting the strips, the crew has laid out the first layer of Spanish cedar veneers. We’re trying a new technique that Brian had learned at the Landing School. It was a huge time saver, eliminating the tedious spiling that I’d always done. While satisfyingly quiet, spiling each veneer is a sequence of cut and fit. Get it right the first time and you can move on. Screw it up and you’re spending untold extra time on a piece of wood that no one will ever see! This method relies on a good straight cutting bit, a small trim router and a veneer stealer for each space. We did this on both halves twice: two layers of 1/8” veneer. It was a hot topic too. I’d spoken to many builders and each one had a different take on strip planking a hull. To sheath or not to sheath? Three layers of veneer or none? Sheath with 1708 Biaxial or veneers? We were awash in opinions and testimonials. Finally, I made the call: we sheath with two layers of cross diagonal Spanish veneers topped off with two layers of 10oz cloth. But first there was still so much to do. The images at the right illustrate the sequence reading left to right and top to bottom. The hull finished out at 3/4" including the 1/2" strips and two layers of 1/8" veneers; perfectly strong shell for a 20 foot catboat. Introducing our new spar division: Strong Island Spars. We have been building superb, hand crafted and intelligently designed and engineered wooden spars for years but until December 2012 we had not resolved the issue of branding. We worked with our marketing guru and the folks at Design Principles, who are responsible for our beautiful web site, PBBS logo and all our marketing materials. The process of designing a logo was grueling. Each revision lead to another discussion and yet another revision. In the end, we are delighted with the outcome. This logo will be branded, literally, on all our spars. 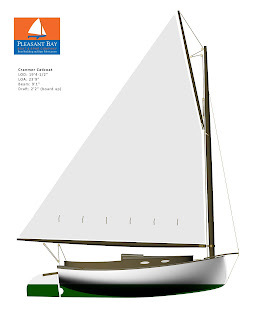 Our marketing efforts have matched our growth as boat builders. We listen to the advice of people who know this stuff, and slowly things start to click, just like building a boat; step by step. In hind sight, it has been worth every step. January saw the hull come to life fast. The Crammers were a tremendous help, driving down from Boston each week to lay down veneers and then fair (translated: sand, sand, sand). February saw things slow a bit. Two boats shows and two snow storms really didn't help. The skeg and outer keelson were complicated by the fact that we were not 100% sure about the e propulsion yet. We were still debating systems but finally determined the shaft and prop size so that Seth could proceed. As of Friday, March 1st, the outer stem was glued up and the skeg cut and shaped. Scheduling a project like this in a busy shop is always a big challenge. The crew is hard at work but hours slip into days and then the owner will ask the all important question: how are we doing on time and budget? We have put every tool in place to track labor and materials but it's hard when you're actually involved in the work. Once in a while we had to take a break (deadline is looming) and extrapolate all our combined times to see where we are. It's an crucial part of the build that everyone is fully familiar with: how long does it really take to build this boat? I have devised spreadsheets, three ring binders, little pocket notebooks, online time-sheets ad nauseam. But when the crew is deep into it it's really hard to stop. The crew at Pleasant Bay Boat and Spar Company is incredibly talented and responsible. They are invested in the positive outcome of all our projects, big and glorious to the small and thankless.They want our customers to be happy and are aware of the back story to each and every project that comes into the shop. You can't ask for a better crew to work with. Visit our Catboat page on Facebook to see the full photo album of the Cranmer's catboat. 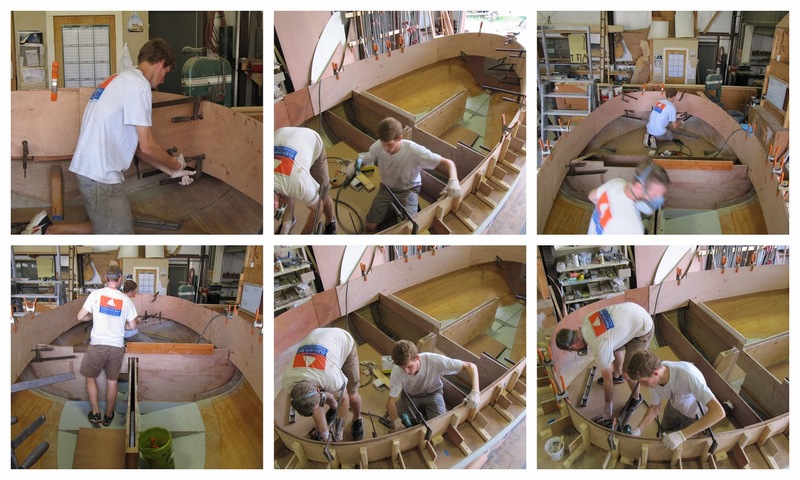 Three years ago we started talking to Mike and Susan Cranmer about designing and building their dream catboat. 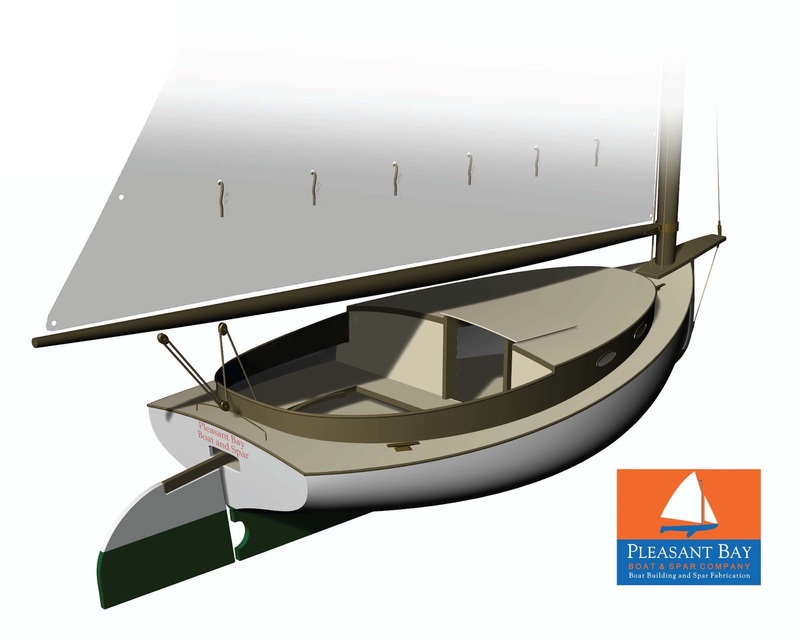 The intention was to have the design drawn by another boat builder and Pleasant Bay Boat and Spar Company would build it with the help of the Cranmers. Turns out, we ended up designing the boat ourselves, with their blessing and support. 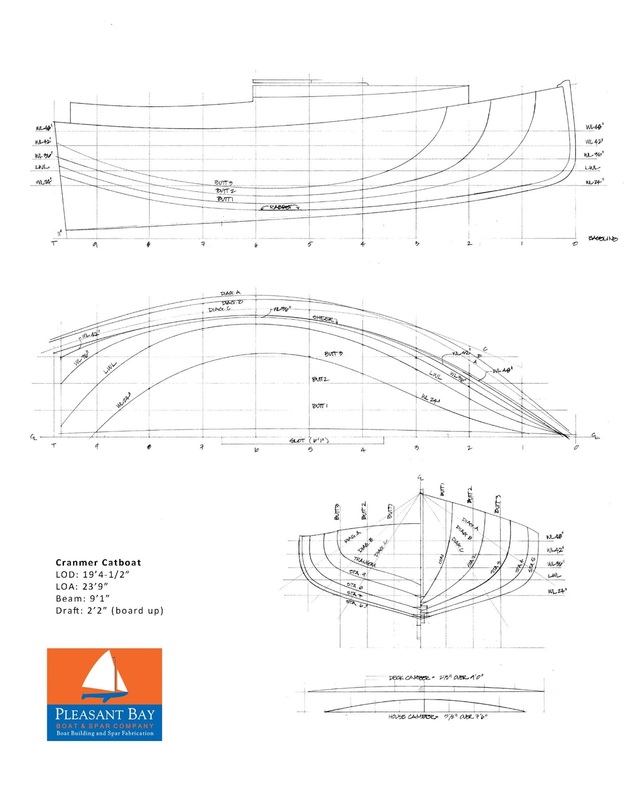 I had never designed a boat before but catboats have such a rich history, and the Cranmers knew exactly what they wanted, which made the process relatively, well...not easy but not that difficult either. Nine months after we started, we had settled on the final shape. She would draw her influences from Hanley and Crosby, and from the Cranmers' sailing requirements, which fell into step with our own. We focused on hull shape and performance, comfort as a day sailor with overnights in the realm of possibilities. Mike is tall, so we had to accommodate his comfort both in the cockpit and below. The clincher was going for an electric power plant. Most likely we will install a Mastervolt with the necessary battery bank. This kept the cockpit clear of cumbersome engine boxes, and eliminated the need for all the fuel related parts. Mastervolt and its competitor Thoosa make near-similar engines that drive a displacement boat with relative ease. 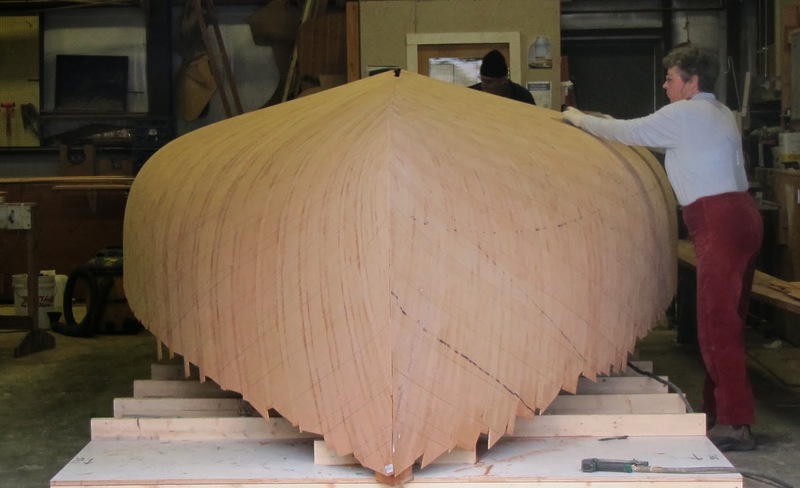 In November 2012 we started lofting the profile, while we waited for the final hull shape to be digitized so that the molds could be plotted and cut by CNC. Seth Ahrenholz is the lead builder on this project, working along with Brian Porter and Doug Ingram. Our shop operates as a team. Each project has a lead builder but the work proceeds on consensus. It makes for lively discussions, a democratic workplace, and no one is stuck doing the same build over and over. Brian is in the process of building our second Hurricane and is doing a fantastic job redesigning the deck for a new mold. Doug is the spar master and will build the Cranmers' rig, after he's built the spar orders for the season! 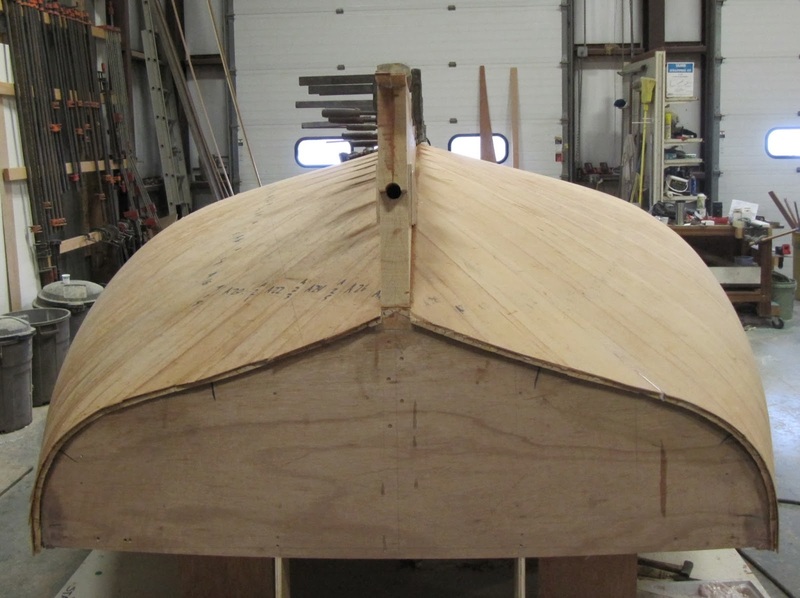 The stem, keelson, transom and centerboard truck had to be fabricated, taking us into December. The progress was slow but steady. The backbone of any boat is like a giant puzzle. You need to focus on the parts, the whole and how it will look when the boat is righted. The hull starts to come into view with each step. All the details that we worked out in the drawing and on the computer are starting to come to life. There are many questions going back and forth between me, who can only draw on paper, and our computer designer, Walter Zesk, of ConForm Lab. He has taken my form and refined it beautifully. The amount of information that was generated from that seemingly simple step was tremendous. We had a learning curve to overcome. I can only explain it as a series of overlays, each containing important information that is one step removed from the preceding one. We did get the hang of it eventually but not without stumbling a bit. Now the molds are set up, faired, checked and double checked. Everything looks great. The trunk is in. The sheer clamps are glued up in place then cleaned up. The Cranmers did an incredible job working with Doug to plane, mill and shape over 144 sticks of what was the most beautiful clear white cedar we'd ever seen. In all, it took 200+ board feet of cedar. Today the strips went on with ease. The bead and cove edges making the work of aligning so much better than what we'd dealt with in the past. It was certainly worth the two extra days of milling on the shaper. We're using Pro Set from Gougeon Bros which makes gluing the strips much more controlled. Clean up is less messy and there's no extra glue left over! The progress can be seen in the photo below: 24 strips in less than two hours + 4-1/2 tubes of Pro Set and countless staples. Seth is using a special pneumatic nail gun that uses plastic washers; perfect for removing later when we get ready to fair. The end of the day is my favorite time. Looking around at all the crew accomplished today, I am so happy. This is probably the best feeling in the world: to draw something on paper and watch it come to life. And even though I know there's so much more to do before she's under way, I can feel it in my bones. She's going to be a fabulous catboat.